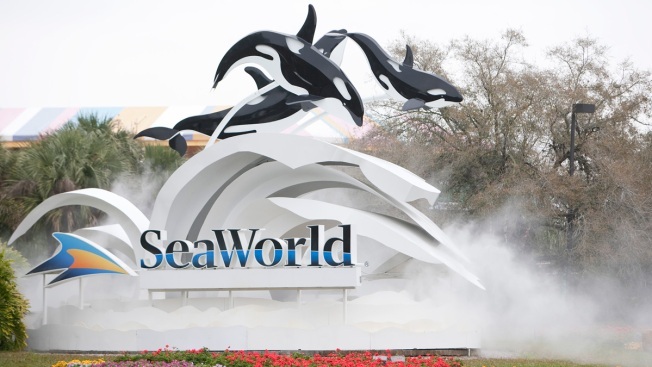 This February 24, 2010, file photo shows the sign at the entrance to SeaWorld in Orlando, Florida. Officials at SeaWorld Orlando posted on its blog that the whale known as Fredi died Saturday. A spokeswoman said in an email Sunday that Fredi had shown signs of appetite loss and was undergoing an aggressive anti-microbial treatment. Fredi was part of a mass stranding of 23 pilot whales in 2011 near Cudjoe Key, Florida. SeaWorld rescue team members spent two months in the Keys helping with rescue efforts along with other rescue organizations. Fredi was deemed unable to be released back into the wild due to her young age and she found a home at SeaWorld Orlando.